Clean more square feet in less time with this handy caddy. Clean up to 10,000 square feet with its 2-gallon capacity, reducing number of trips to supply closet. 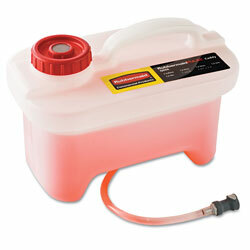 Refills Rubbermaid Pulse™ (sold separately) up to 12 times. Designed for secure transportation and efficient, on-the-go refill. Floor Cleaner from Rubbermaid! 96 In Stock today.